A method to control the propagation of light in confined pathways, or waveguides, has been developed by a team of Columbia Engineering researchers headed by Applied Physics Assistant Professor Nanfang Yu. The researchers used nano-antennas to develop this method with high efficiency. They demonstrated this method by building photonic integrated devices that had record-small footprints. These photonic integrated devices were also capable of maintaining optimal performance over an unprecedented broad wavelength range. Photonic integrated circuits (ICs) are based on light propagating in optical waveguides, and controlling such light propagation is indeed considered to a key issue in building these chips, which make use of light to transport data instead of using electrons. 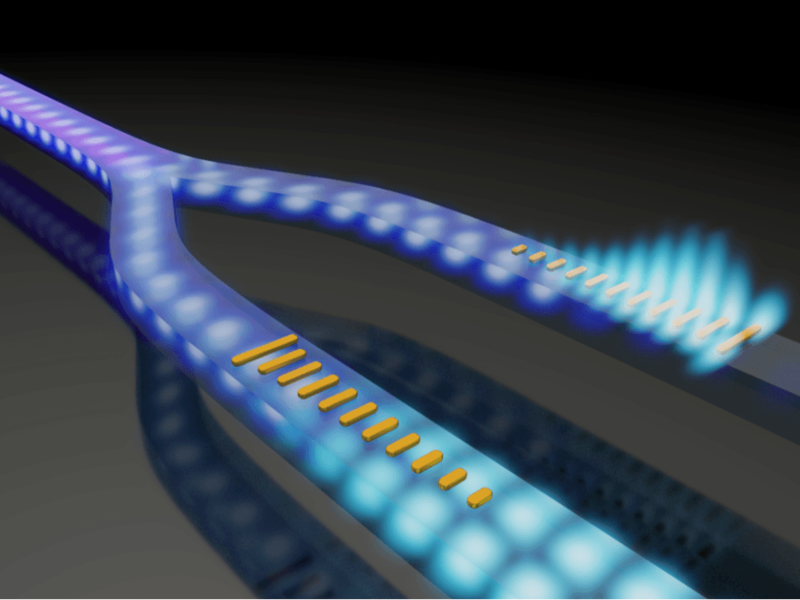 The new method created by Yu could lead to more powerful, faster, and more efficient optical chips, capable of transforming optical communications and optical signal processing. The research has been published in the April 17 online issue of Nature Nanotechnology. We have built integrated nanophotonic devices with the smallest footprint and largest operating bandwidth ever. The degree to which we can now reduce the size of photonic integrated devices with the help of nano-antennas is similar to what happened in the 1950s when large vacuum tubes were replaced by much smaller semiconductor transistors. This work provides a revolutionary solution to a fundamental scientific problem: How to control light propagating in waveguides in the most efficient way? The optical power of light waves propagating all along waveguides is confined within the waveguide’s core. Researchers will be able to only access the guided waves through the small evanescent “tails” present near the waveguide surface. These elusive guided waves are specifically hard to manipulate and because of this photonic integrated devices are mostly large in size, occupying a lot of space and thus limiting a chip’s device integration density. Shrinking photonic integrated devices represents a key challenge researchers intend to overcome, highlighting the historical progression of electronics that follows Moore’s law, that the number of transistors in electronic ICs in fact doubles almost every two years. The researchers discovered that the light in waveguides can be efficiently controlled by decorating the waveguides with optical nano-antennas. These miniature antennas are responsible for pulling light from inside the waveguide core, followed by modification of the properties of light and then releasing light back into the waveguides. A densely packed array of nano-antennas has a strong accumulative effect that allows these nano-antennas to obtain functions such as waveguide mode conversion within a propagation distance that is not more than twice the wavelength. This is a breakthrough considering that conventional approaches to realize waveguide mode conversion require devices with a length that is tens of hundreds of times the wavelength. We’ve been able to reduce the size of the device by a factor of 10 to 100. Waveguide mode converters were developed by the team in order to convert a specific waveguide mode to another waveguide mode; these are considered to be are key enablers of a technology called “mode-division multiplexing” (MDM). An optical waveguide has the potential to support a set of higher-order modes and a fundamental waveguide mode, similar to the manner in which a guitar string can support one fundamental tone and its harmonics. MDM is an approach to substantially augment an optical chip’s information processing power. It is possible to use the same color of light but a variety of waveguide modes in order to transport a wide range of channels of information in a simultaneous manner, throughout the same waveguide. This effect is like, for example, the George Washington Bridge magically having the capability to handle a few times more traffic volume. Our waveguide mode converters could enable the creation of much more capacitive information pathways. Yu plans to integrate actively tunable optical materials into the photonic integrated devices to allow active control of light propagating in waveguides. These active devices will be the fundamental building blocks of augmented reality (AR) glasses, referring to goggles that initially determine the eye aberrations of the wearer followed by projecting aberration-corrected images into the eyes. Yu and his Columbia Engineering colleagues, Professors Michal Lipson, Alex Gaeta, Demetri Basov, Jim Hone, and Harish Krishnaswamy are currently working on developing these AR glasses. Yu is also analyzing ways of converting waves propagating in waveguides into strong surface waves, which could ultimately be used for on-chip chemical and biological sensing.